Description: Everett-Sumas power resting up at Delta Yard Roundhouse. Description: BNSF 8012 Westbound between Hardin and Billings Montana. Description: Service area at north end of yard. Description: A single engine brings army vehicles southbound on the UP lines in Jonesboro. Title: BNSF 547, BNSF 3028, BNSF 4124 and BNSF 6895. Description: Shutter delay, and it was a total surprise, screwed this shot. Description: Former BN and CB&Q Geep on the servicing tracks in Willmar. It's good to see that large BN logo on its nose. Description: A rare GP40E still in cascade green rests in Aberdeen. 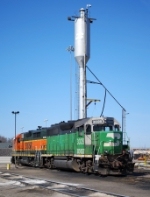 Description: Still wearing Cascade Green, the 3028 has become a Sioux Falls regular in 2012. Description: A trio of Cascade Green locomotives running together in 2012, a rare find indeed!